I don't know about you but I'm one of those people who loves to buy office stuff. Notebooks especially. There's nothing like a blank notebook. Maybe it's because I'm a writer but there's something about a brand new notebook that makes me so happy! It's kind of like that first day of school feeling - the hope of a new beginning. So I was absolutely thrilled when Carolina Pad offered to send me one of their Simply Chic Ideal Portfolios! This is my kind of notebook: it's cute, pink, faux croc and super functional! Inside there's a notepad and a place to stow a pen and slot in various sizes where you can stash things like post its or business cards. Or of course, coupons! The cover latches easily with a magnetic clasp and the case is sturdy enough that you can just throw it in your purse or bag and run out the door! They also sent me of their adorable Organizational Folders in lime green! It has 8 pockets and is great for filing or just keeping things like recipes, design ideas or notes. Right now I'm using it to help sort out paperwork and mail that needs to be filed. Why not jazz up an otherwise boring task, right? And the cover of the folder is super durable plastic so it won't rip! 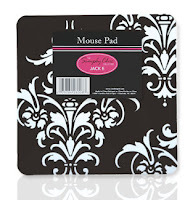 Carolina Pad has some wonderful products and the best part is that they are functional AND fun. No stale plain cover notebooks here! I'm a big fan of anything black, white and damask and they have some absolutely gorgeous desk accessories in their simply chic line. Check out this super cute mouse pad!. They also have some gorgeous botanical style Photo boxes that would be perfect for storage in my dressing room (a work in progress). Carolina Pad strives to make bring their customers extraordinary fashion and innovation to everyday products. *Visit the Carolina Pad Web Site and tell me what your favorite product is! I love all of the Simply Chic stuff - especially the padfolio and the note tote. Can you tell I really want to win this one? Wow, I would love the laptop bag! I like the EYE CANDY INDEX CARD BOX. I think it looks so fun for storing people's contact info in. It is a cheery way to look up a friend's number. Way too cute!! My tween niece would love that stuff! Too Cute. I love the organizer folder, it would really come in handy for alot of things. I have subscribed to your blog. I love it! Thank You. I love the Simply Chic Laptop Sleeve! I too love the simply chic line - love the index card box and the file folders. I don't have a blog but read yours often. Love it!! I too like the simply chic line - the index card box & the file folders...Oh and the hanging folders! Love it all!! I do not have a blog but I follow yours often and really enjoy it. Everything is so cute! But I love the eye candy journal! Thanks for the giveaway! I'm already a subscriber, I just followed you on Twitter and I tweeted the giveaway. I plan to blog about it and add a button to my blog tonight as well! I love the Simply Chic. Anything with houndstooth is awesome. Great giveaway. I like the prints charming line. I am following you on twitter and I also tweeted about the giveaway! I really like the Sticky Notes from the Hot Chocolate Collection, thanks so much for such a wonderful giveaway! They are all way too cute. I like the Simply Chic Note Tote. I love the Simply Chic Padfolio in pink. I like all of their Eye Candy collection. Talk about colors that p-o-p! 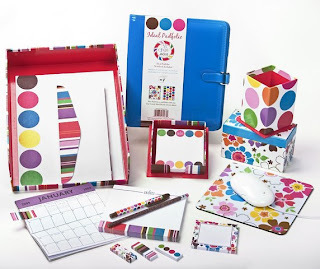 I love the eye candy collection, it is my style.One of the best items would be the Eye Candy 8-Pocket Organizational Folder. they are all so cute. I love notebooks to right all your fabulous deals in. Eye Candy Laptop Tote is my favorite. I like the pink eyecandy padfolio. This would be great to have for work! I like the organizer folder. So useful! Such a tough decision...there are so many choices! I believe my favorite is the Hot Chocolate Collection -- especially the notebook and file folders. I subscribe to the newsletter too.. I love the 8 pocket portfolio organizer. Anything that cute can definitely help keep our homeschool papers in order. eye candy notebook but I like the simply chic line also. I really like all the collections but the eye candy is so cute. Thanks, Deidre. I am also a a blog subscriber. All of their stuff is adorable! I really liked the eye candy magnets and was impressed how reasonably priced everything was! My favorite is the Hot Chocolate Desk Calendar. I'm a subscriber, though not a new one. Is it really fair to penalize loyalty like that? I'm just asking. Not complaining. Not me. Never. My favorite is the Eye Candy Journal! So cute! OK, I completed the final mission LOL! I put your button on my blog and blogged about the contest too! Organizational products are my weakness. And these are so cute! I think my favorite things are the photo boxes. Ohhhh everything on this site is so cute! But I think I really love the Eye Candy 8-Pocket Organizational Folder. Thanks for the chance to enter. I love the graphic in nature photobox in pink... so pretty. All the Eye Candy stuff is gorgeous though! I love Eye Candy Padfolio, the whole collection is so pretty! My favorite product is the Eye Candy Collection and the Hot Chocolate Collection. My name is Miss Rachel Dixon. You can contact me at dixonchick93 AT gmail DOT com. And my favourite thing on the CP site would be the Simply Chick Portfolio. It's really cute. I am subscribed by email now. Oh and I a new subscriber to your blog. :) I found you through twitter. LOVE THE EYE CANDY LAPTOP BAG! The simply chic storage box is cute! love stationary!! love the bright colors of all of thme! I really like the eye candy collection, but all of it is nice! Looks inspiring and fun! Thanks! I like the Simply Chic Laptop Sleeve! 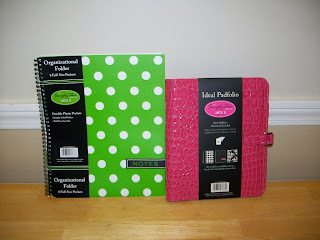 The pink faux croc padfolio is way spiffy!